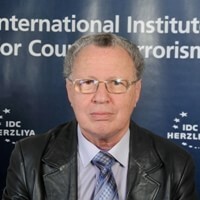 Dr. Ely Karmon is a Senior Research Scholar at The International Institute for Counter-Terrorism (ICT) and Senior Research Fellow at the Institute for Policy and Strategy at The Interdisciplinary Center (IDC) in Herzliya, Israel. He lectures on International Terrorism and CBRN terrorism at the M.A. Counterterrorism Studies at IDC. He holds a B.A. in English and French Culture from the Hebrew University in Jerusalem (1964), a Licence in International Relations from the Institut d’Etudes Politiques and a Licence in Bantu languages from the Ecole de Langues Orientales, in Paris (1969). He earned his M.A. and Ph.D. in Political Science from Haifa University (1996). Associate Fellow, International Centre for the Study of Radicalisation and Political Violence (ICSR), London. Member of the International Permanent Observatory (IPO) on Security Measures during Majors Events at the United Nations Interregional Crime and Justice Research Institute (UNICRI), Turin, Italy. In this framework he participated in UN seminars preparing security at Athens Olympics (2004), Turin Winter Olympics (2006) and Beijing 2008 Olympics. Dr. Karmon briefed Shanghai authorities on security and threat assessment for the Expo 2010 event. Member of the General Assembly of the International Institute for Security and Cooperation, Sofia, Bulgaria. International Expert to the Civil Military Disaster Medicine Committee of the International Disaster Medicine Association (IDMA), Naples, Italy. Member of the Editorial Board of Revista Universitas/Relaçoes Internacionais, journal of the Centro Universitário de Brasília – UniCEUB. Dr. Karmon is member of the Atlantic Forum of Israel and is involved in NATO workshops on terrorism and on the Mediterranean Dialogue. Visiting fellow (2002) at The Washington Institute for Near East Policy, which published his policy memorandum Fight on All Fronts? Hizballah, the War on Terror, and the War in Iraq (December 2003). Has been Fellow at the Proteus Management Group (PMG), a think tank focusing on future scenarios at the Center for Strategic Leadership, U.S. Army War College, Carlisle, PA. Served as advisor to the Israeli Ministry of Defense and the Anti-Semitism Monitoring Forum of the Israeli Government Secretariat. His fields of research include political violence, international terrorism, CBRN terrorism, and the strategic influence of terrorism and subversion in the Middle East and worldwide. Has written extensively on international terrorism and strategic issues of the Middle East and has participated in numerous international conferences. His book Coalitions between Terrorist Organizations: Revolutionaries, Nationalists, and Islamists was published in May 2005 by Brill Academic Publishers (Leiden and Boston). The Center for Strategic Leadership, U.S. Army War College, published his monograph, ‘Iran–Syria-Hizballah–Hamas: A Coalition against Nature. Why does it Work?’ (May 2008). Dr. Karmon is a frequent commentator on Middle Eastern issues in the Israeli media (Haaretz, Jerusalem Post, Times of Israel, Israeli TV channels, Kol Israel, i24News TV), for the Spanish daily El Imparcial and numerous media outlets worldwide.